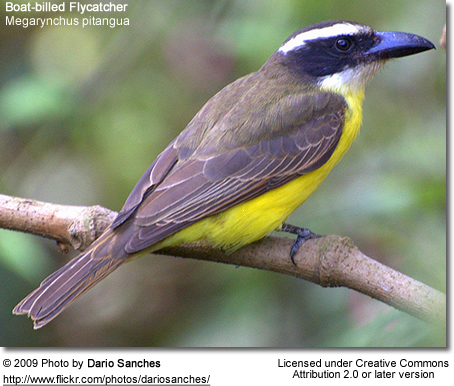 The Boat-billed Flycatcher, Megarynchus pitangua, is a large tyrant flycatcher. Adult Boat-billed Flycatchers measure 23cm in length. The head is black with a strong white eyestripe and a concealed yellow crown stripe. The upperparts are olive-brown, and the wings and tail are brown with only faint rufous fringes. 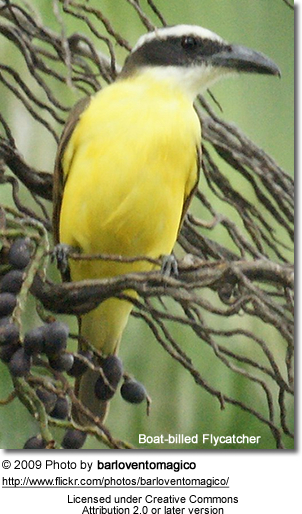 The underparts are yellow and the throat is white. 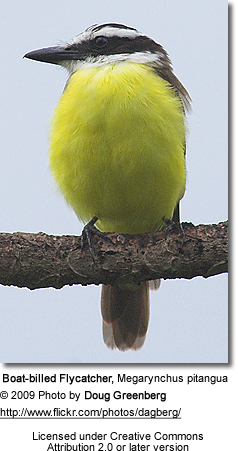 The massive black bill, which gives this species its English and generic names, is the best distinction from the similar Great Kiskadee, which also has more rufous tail and wings, and lacks the olive tone to the upperparts. 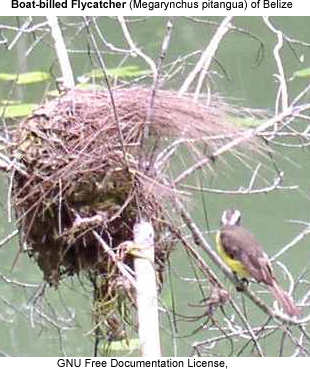 The nest, built by the female, is an open saucer of sticks. The typical clutch is two or three whitish eggs heavily blotched with brown. These are incubated mostly by the female for 17-18 days with a further 24 days to fledging. The call is a strident trilled nya, nya, nya. Boat-billed Flycatchers wait on a concealed perch high in a tree and sally out to catch insects in flight. They will also take invertebrates (= animals without internal skeleton, such as insects, larvae, earthworms, millipedes, snails, spiders) off the foliage and eat some berries.